Stephen Owellen was given a four month suspended prison sentence after he smashed open a driver's cab aboard a Metro train and attacked the driver. Body cameras worn by police officers called to the scene show the enraged Owellen kicking and headbutting the doors on the empty Metro carriage, which was stopped at Regent Centre. Now Nexus, which operates the Tyne and Wear Metro, has said it is 'disappointed' that the man was not sent to prison. The 33-year-old appeared at North Tyneside Magistrates' Court last week and pleaded guilty to one charge of battery and one charge of criminal damage following the attack which happened on February 9. 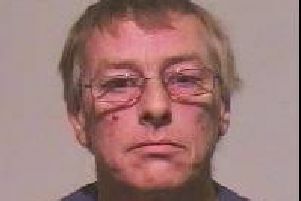 Owellen, of Pitcairn Road, Sunderland, was sentenced to 4 months suspended for 12 months. He was also ordered to pay compensation of £200 to the driver and a further order for £100 to Nexus for the damage to the metro. Metro Services Director, Chris Carson, said: “The safety and security of our workforce and customers is our top priority. Assaults on Metro drivers will not be tolerated. “We are disappointed that the person who committed this assault did not get sent to prison. This was a member of staff in uniform performing an essential public service who has ended up facing violence. Nobody deserves this kind of treatment when they’re at work. “While offending of this severity is rare on Metro, any kind of attack on staff, verbal or physical, is completely unacceptable. I’m thankful that the Metro driver wasn’t more seriously hurt and that the police were able to detain the offender at the scene. “We have put in place a series of measures to enhance safety and to deter crime and anti-social behaviour on Metro. Frontline staff have been issued with body-worn CCTV cameras and we are increasing the number of staff on the system to record levels. “We already work closely with the police and have stepped up high visibility patrols on the system where our own staff work alongside the Northumbria Police Metro Unit and Neighbourhood Policing Teams.